I’ve been continuing to scratch a serious American War of Independence itch for months now. 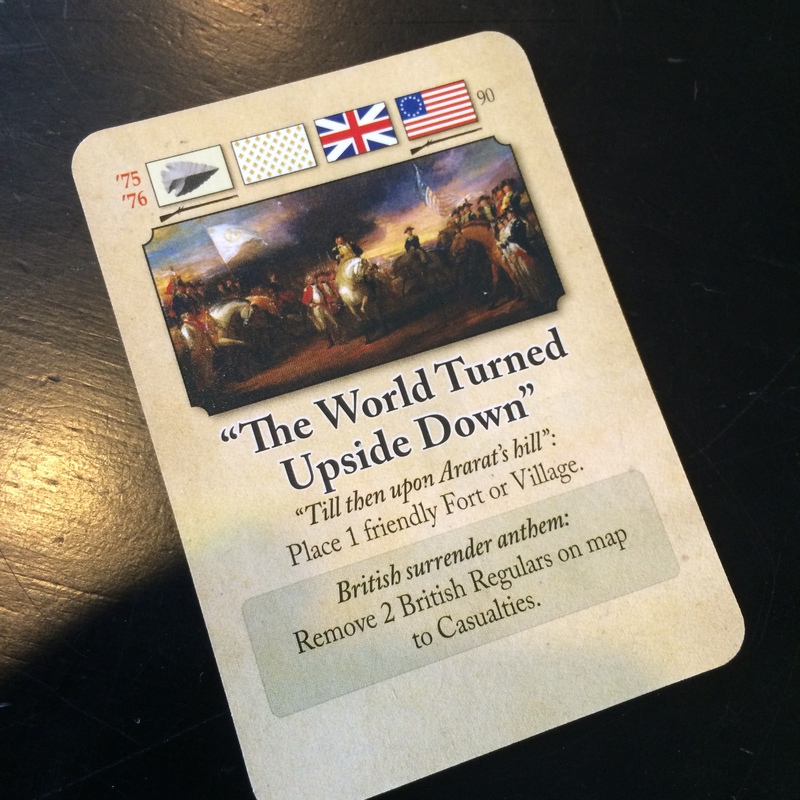 Last summer I took a first pass at some of my favorite games of the period in Boardgames of the American Revolution, Part I. Since then, gamers have also been blessed with the release of Liberty Or Death: The American Insurrection, and it has fast become one of my all-time favorites among all the games I’ve played. 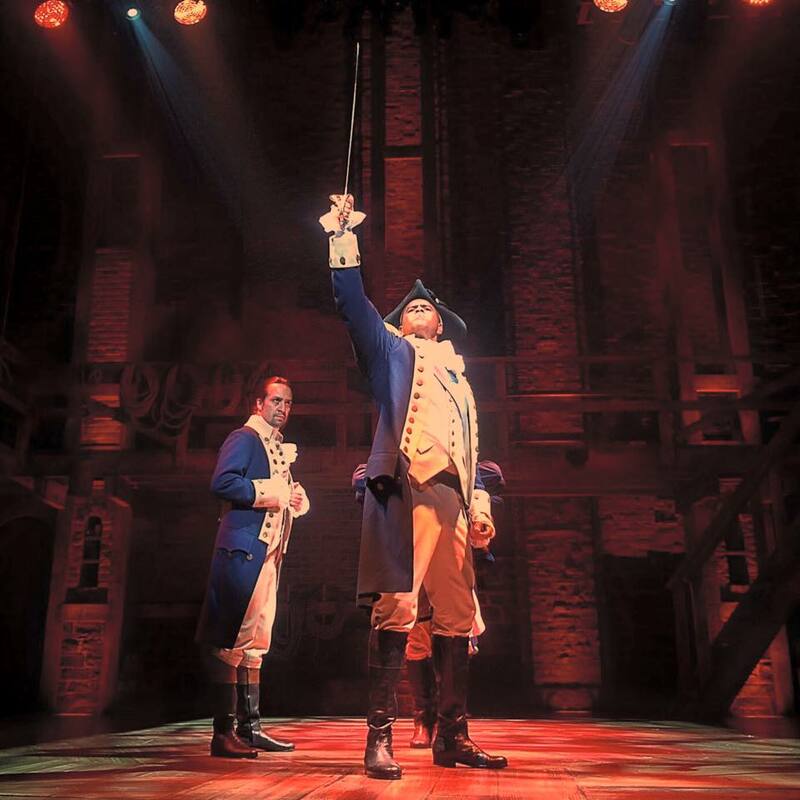 Away from the tabletop, I’ve been swept up in the fervor of Hamilton: The Musical and have been fortunate to catch the show twice on its record-setting Broadway run here in NYC. I’ve also recently revisited 1776 from 1969 and it’s 1972 movie adaptation. As luck would have it a new production will run for one weekend in early April at City Center here in the city, and yes, I’ve already got my tickets. 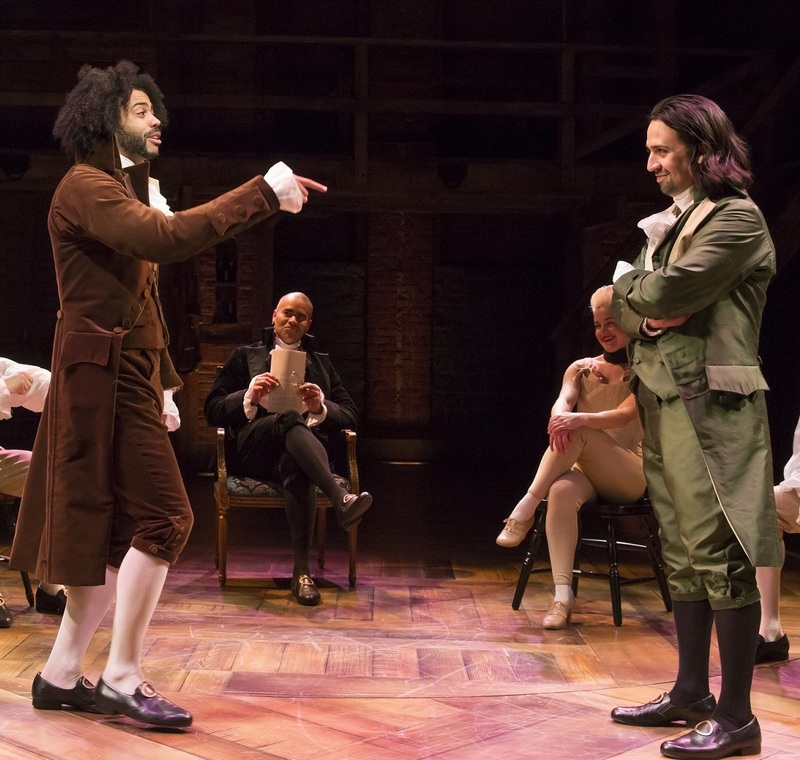 A side note of Broadway trivia is that 1776‘s Tony Award-winning Broadway debut was in the same theater where Hamilton is currently running, and it too seems destined to sweep the awards in June. In this Part II, I take a look at more games of the Revolution I’ve managed to acquire and/or play in the past six months. Like the last time, this is not meant to be a comprehensive list. Despite my best efforts there are a lot more games I have yet to touch. What this round presents is again a variety in scope, mechanics and time commitment for gaming the Revolution. Avalon Hill’s We The People from 1994 is a landmark in the history of modern wargaming. 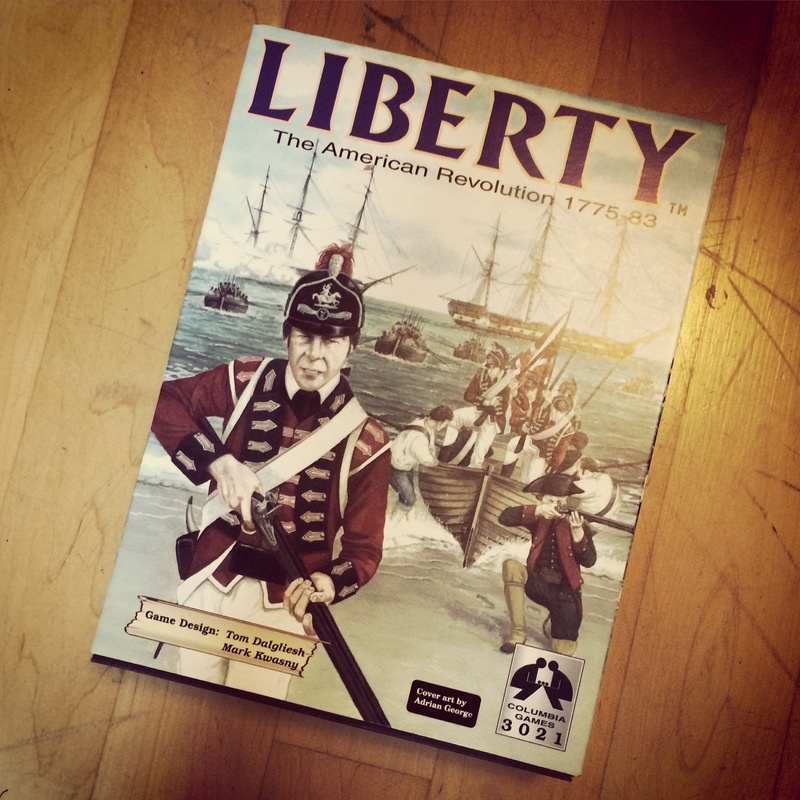 In taking on the well-worn American Revolution, designer Mark Herman created a number of innovations which have provided the basis for some of the most successful games of the past two decades. 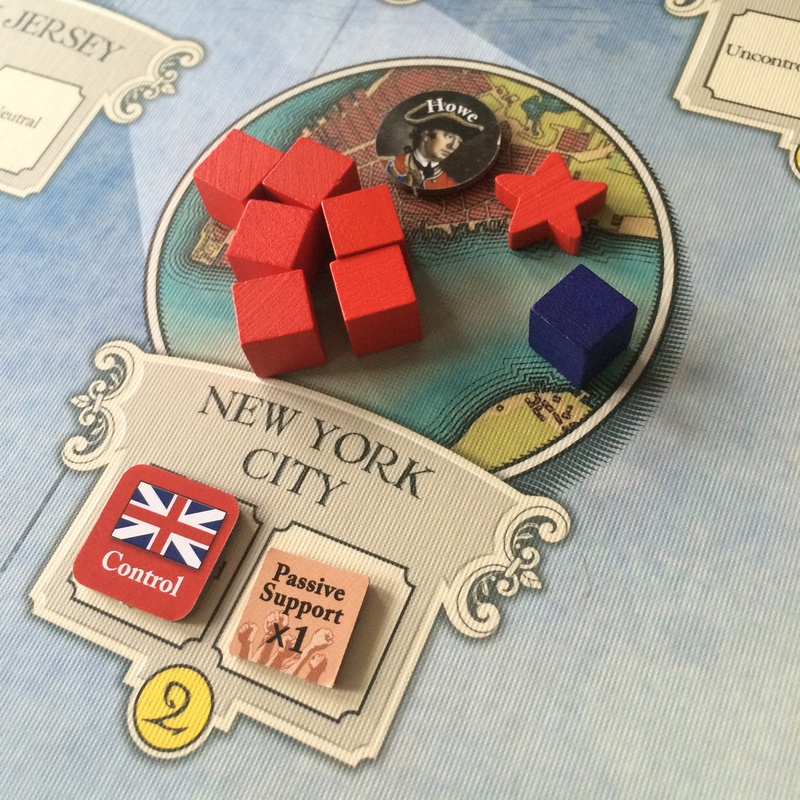 Breaking from the standard hex maps of most prior wargames, WTP’s playing board of the British colonies of North America is abstracted into a series of connected key politically important locations like Long Island, Boston, Fort Niagara and Charleston. While battles play a part in controlling these areas, it is the shifts in political control that are tracked and lead to victory. Combat in WTP was also stripped down in a few ways. Basic troop units mark the size of forces, but their quality is modified through the presence of leaders. When forces choose to clash in the game, battle cards are used to resolve various battlefield actions steeped in the terminology and effects of 18th-century warfare. Lastly, the newly-introduced card driven game (CDG) mechanic propel the game’s action through the play of cards, rather than the more traditional roll of dice. With each hand of cards, players have the option of using them to play historically significant events which have varying results for each side of the conflict. Long term planning and success within the game often comes down to having the right cards at the right time. An old copy of WTP sits on a shelf of club games at Metropolitan Wargamers in Brooklyn, NY, and I recently blew the dust off it for a play. Despite its status at the time of release, I honestly don’t find myself getting this one on the table very often. That said, I feel this game’s presence in so many games I play on a regular basis, and so its true game-changing effects on the hobby reverberate to this day. 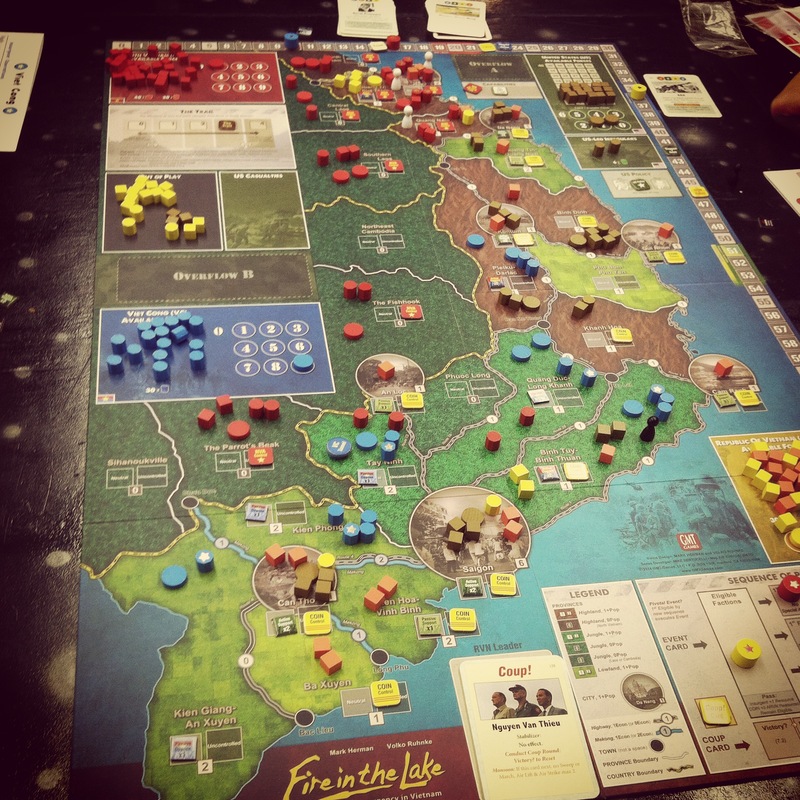 Building on the success of WTP, Herman revisited his game of the Revolution in 2010 with Washington’s War from GMT Games. Players familiar with WTP found much similarity with Herman’s original depiction of the period but with a few significant changes. The CDG mechanic was tweaked to allow for more flexible use of cards and the ability to ‘buy back’ discarded cards. WW also abandoned the battle cards for a dice-off combat resolution, making combat a quicker and more elegant part of the game. I feel the biggest change was in the more asymmetric representation of how the British and Colonial sides each play. The experienced troops of the King are strong on the coasts with their dominant naval power, and the Americans fair better inland but vie with keeping their militia in the action. Generals remain important to both sides, and the French entry to the war plays out in a way that truly captures the historical impact it had. All the evolutions from WTP make the more recent game a quicker affair, with WW games running at about 90 minutes as opposed to the two hours or so to play WTP. The upgrades to the design and quality of the board, cards and playing pieces all brought the War of Independence into the 21st-century. In 2008 Worthington Publishing released Hold The Line, a flexible game of the Revolution with a wide appeal from beginners to experienced gamers. Building on the success of their Clash For A Continent: Battles Of the American Revolution and French & Indian War game from three years before, HTL presents a blank hexagonal hardback game board which can be laid out with dozens of included double-sided terrain tiles representing streams, bridges, hills, forests, towns, fences and entrenchments. Terrain has varying effects on line of sight and movement within the game. Rectangular and square cardboard tiles represent British and Colonial elite, militia, regular and light infantry, dragoons, artillery and generic commanders. The chunky tiles are double-sided to mark losses as game battles unfold. Each turn players roll for random action points which may be spent to move, rally or fire, allowing for each commander to make choices in utilizing their troops. Additionally, the quality of troops and commander presence modify movement and fire ranges. For a simple series of rules, there’s a lot of game in HTL as even the most careful planning by one side over a series of turns can result in a foiled plan if subsequent action point rolls don’t provide enough actions to carry out a planned move or attack. HTL comes with thirteen scenarios for historic battles, each with their own page of historic background, rules and guide to set up. Additional optional rules allow for specific historic leaders, rally rules and morale modifications.Once you’ve played through the included scenarios, numerous additional battle scenarios can be found online from fans of the game. Within a simple design, flexible scenarios and a short set of rules, it’s easy to see why this currently out of print game is a favorite. 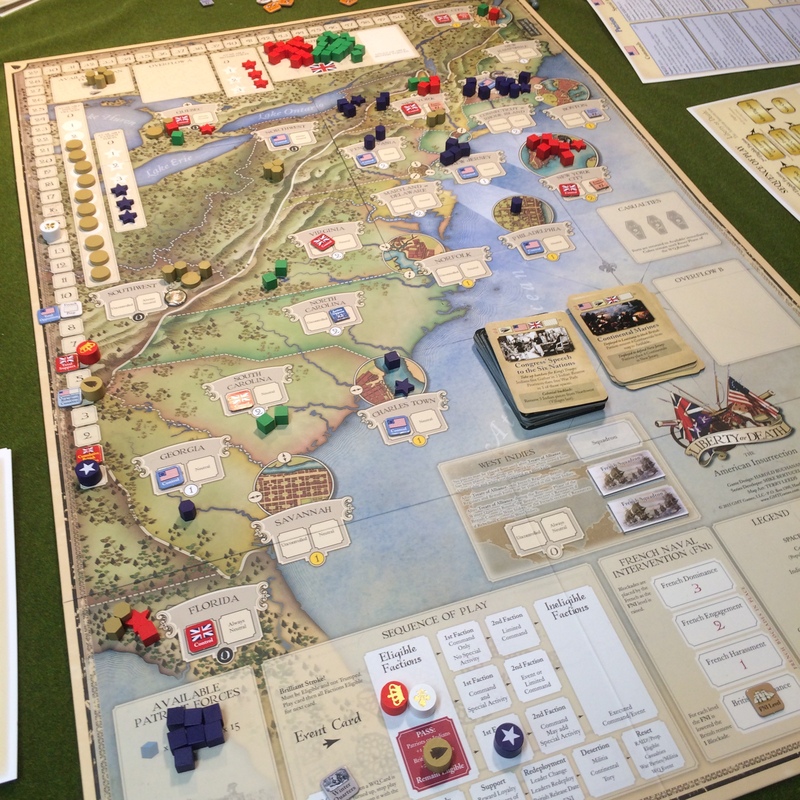 Between 1998 and 2013, GMT Games released a series of standalone games of the Battles of The American Revolution. Designed by Mark Miklos, each is a more traditional hex and counter game running three to six hours to play. For those looking to dig into eight key engagements of the War of Independence, the games offer nuances to reflect the historic events and personalities which shaped each battle wrapped in a beautiful modern design. In late 2015 GMT announced the re-release of the first three games in the series — Saratoga, Brandywine and Guilford — as a tri-pack available through their P500 pre-order program. Since I have never played any of the games from the series, I jumped at the chance to get in on the deal of $45 for three games. The games will get upgrades to mounted maps and a unified rulebook, and additional expansions and tweaks to components a offered in reprints over the years will also be included. The main factors in consideration of the above for me are look, mechanic and importantly, time commitment. Some of the older games from SPI and Avalon Hill just require too much time for me at this stage in my life, and getting a quick game in with my fellow club members or my kids is a big determinant on what gets to the table these days. What this two-part exercise has done for me is expose how such a diverse gaming experience can be pulled out of one signature conflict with a mix of maps, cardboard and cards. Playing through a span of forty years of American Revolution games, I can only wonder where some designer takes things next. Having gamed my way through the War of Independence, I’ve been spurred on to take a step backward in time to the French and Indian War and see what is revealed on the table next. A package containing my most highly-anticipated game of early 2016 arrived a couple weeks ago, and I finally unpacked and played all the glory that is Liberty Or Death: The American Insurrection by GMT Games. 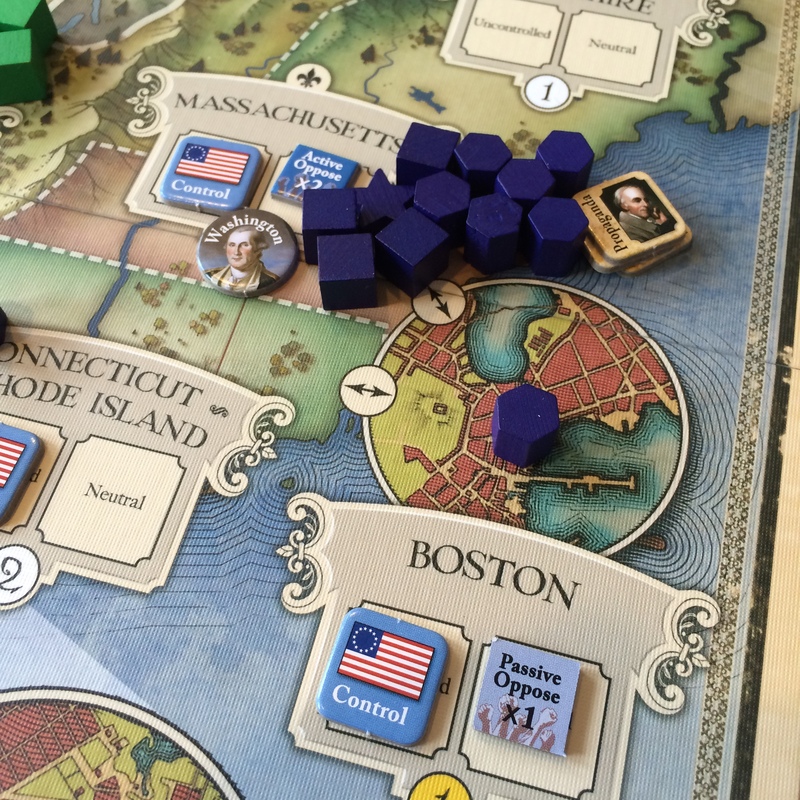 Designed by Harold Buchanan in consultation with the creators of of GMT’s COIN series of games (including Volko Ruhnke), LoD places the American Revolution within the context of an 18th-century counterinsurgency on the American continent. Buchanan is a true inspiration as a first time game designer at midlife putting his passion for the period to work on the tabletop. Interviews at The Tattered Board podcast and Grogheads reveal Buchanan’s story of a lifelong gamer (with a degree from MIT in Finance and Game Theory) whose kids have grown up and out of the house, allowing him the time to pursue game design. His love of the Revolution and gaming has truly paid off with LoD. I’ve played multiple games of Cuba Libre and Fire and In The Lake from the COIN series over the past couple years, and those familiar with the mechanics of these games will find much familiarity and a few new differences in LoD. 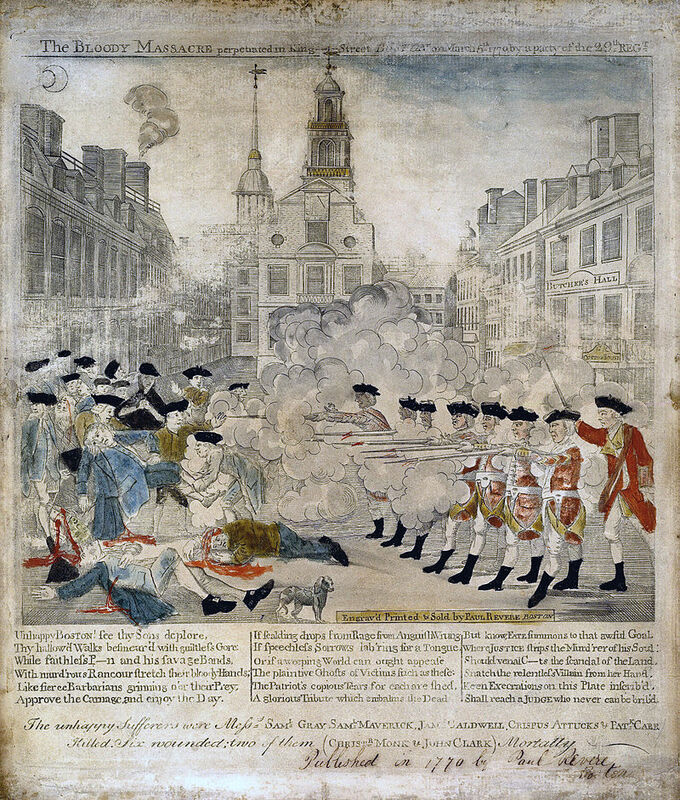 The game presents the American Revolution as one among four factions — British, Colonial, French and Indian — each vying for their own victory conditions. The British control both Regular (red cubes) and irregular Tory (green cubes) forces, the Colonials play with Continentals (blue cubes) and irregular Patriot Militia (blue cylinders), the French use Regular (white cubes) troops and the Indians field irregular War Parties (tan cylinders). Two loose alliances of British/Indian and Colonial/French work in concert to move and occupy city and Colony territory while battling, building forts and settlements and controlling political dissent. As in the other COIN games, LoD action is driven through a set of beautifully-designed cards. Cards provide varying turn order with depictions of historical events a player may choose to play or not play according to their force’s (or their ally’s) advantage. Alternatively, players may opt to perform a series of other combinations of actions specific to their nationality to move, battle, skirmish or raid, muster forces, build forts and villages, manage coastal blockades, promote propaganda or share in economic support and trade. An active card is in play with a look ahead also granted to the next card to be played, giving the game a true campaign feel as future moves are plotted, executed or thwarted. Once a series of cards are played through, a season ends with the draw of a random “Winter Quarters” card. These cards, each with their own individual effect, create a round of actions where victory conditions are checked, resources are gained or spent, forces redeploy or are removed from the game and leaders may change. The variable combinations of turn order, events and actions contribute to the significant replay value of LoD, as even similar periods of campaigns may play out very differently in each sitting. One of my favorite aspects that sets LoD apart from many games is the relative non-involvement of the French early in the game. The French player does not start on the board at all, but instead spends the early game offering monetary support to their Colonial allies. Once certain conditions are met in terms of Colonial victories over the British, the French enter the game by landing troops and offering naval support and blockades of coastal city ports. A French victory is achieved through the accumulation of British casualties and opposition to British rule. The Indians are likewise an interesting faction with their main concern of building villages in territories while helping the British maintaining their hold on the hearts and minds of the colonies. Indian war parties assist the British through harmful raids which reduce the effectiveness of the Colonials while also advancing their tribal territorial expansion. Victory for the Colonists comes through the British casualties and holding the growth of Indian villages to a minimum against the construction of Colonial forts. 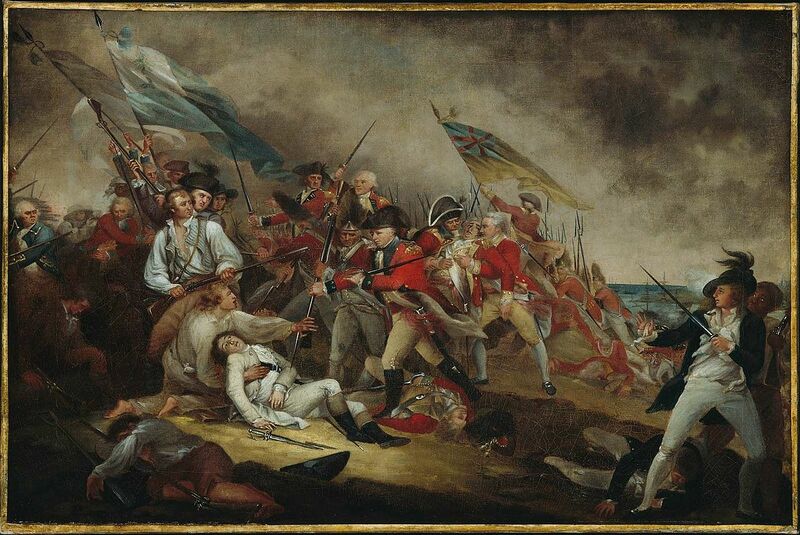 A British win arrives with the accumulation of Colonial casualties and support for the King. Another way LoD differs from other COIN games is the insertion of leaders to each force, such as Gage, Washington, Rochambau or the Indian chief Cornplanter. As the game goes on, some leaders may randomly swap out for others, making it yet another variable for players to manage. With each leader holding their own set of unique abilities and modifiers, players need to work effectively to utilize them knowing full well they may be replaced in future turns. Each faction also receives a “Brilliant Stroke” card for one-time use in the game to trump another player’s turn and perform an extra series of free actions. Additionally, the French’s entry comes with the achievement of game prerequisites and play of their unique “Treaty of Alliance” card. Figuring out the exact moment to deliver a big, often game-changing, play with one of these special “Brilliant Stroke” cards looms large in the mix of decision making throughout the game. The entire design of the LoD is wonderful, with a rich playing board hinting at design elements of 18th-century maps without any compromise to game play. The cards are likewise rich in their look and content, each summarizing an aspect of the war or its politics in just a few lines of text and game effects. 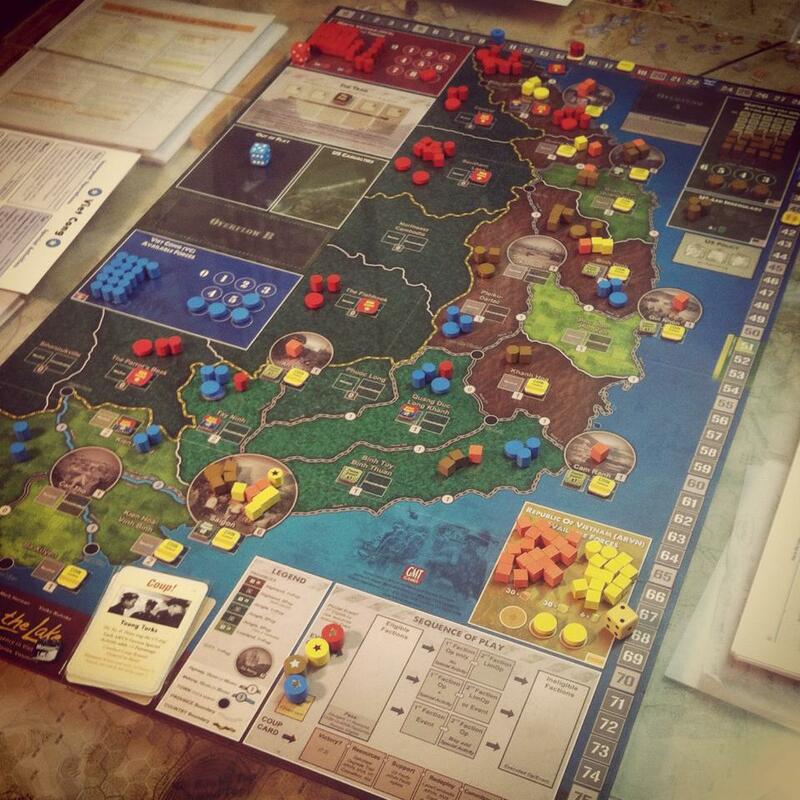 The rules and playbook are well done, and the designers notes by Buchanan and Ruhnke are well-worth a read for historical background and tips to playing to the strengths of each faction. A game of LoD may be played in one of three campaigns of varying length. 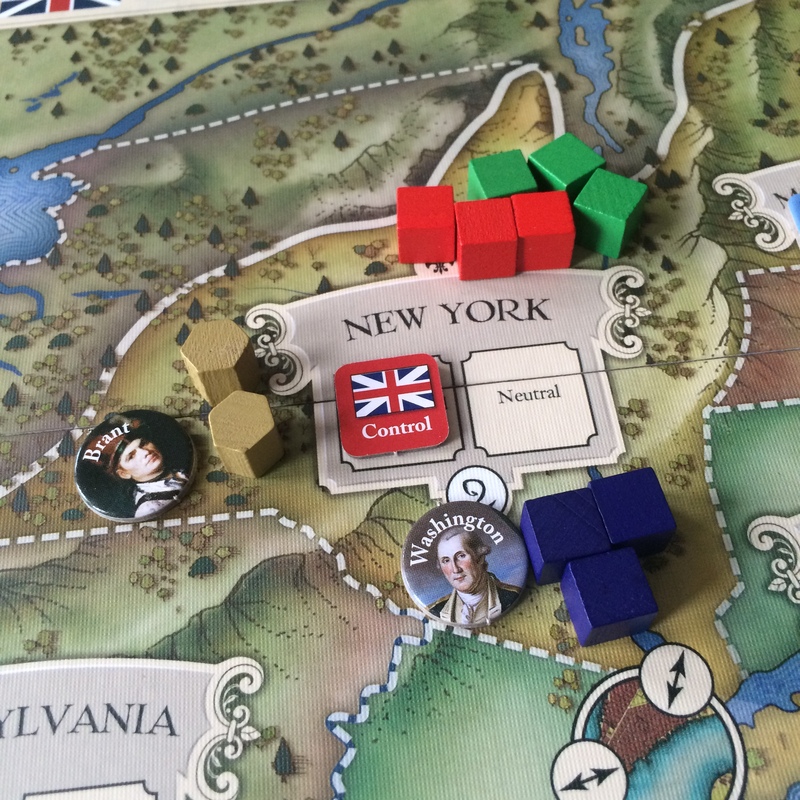 A short late war game from 1778-1780 is outlined in “The Southern Campaign,” and a mid-length “British Return to New York” scenario runs in the early war of 1776-1779. 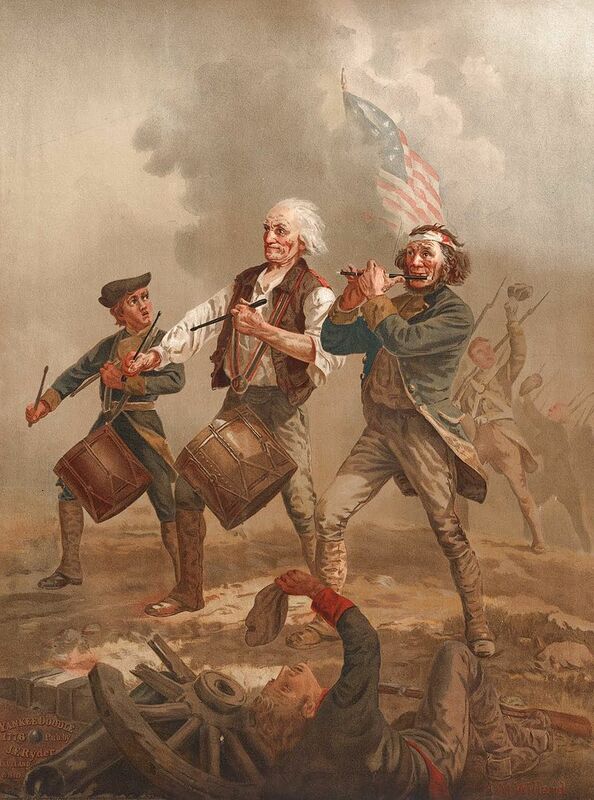 Players wishing to roll up their sleeves for a long game can tackle most of the war in the 1775-1780 period with “A People Numerous and Armed.” Each scenario provides specific starting situational set-ups as well a guide to creating decks of cards for the campaign seasons with the game. A brief guided intro scenario also makes a first-time walk through of the game time well spent. 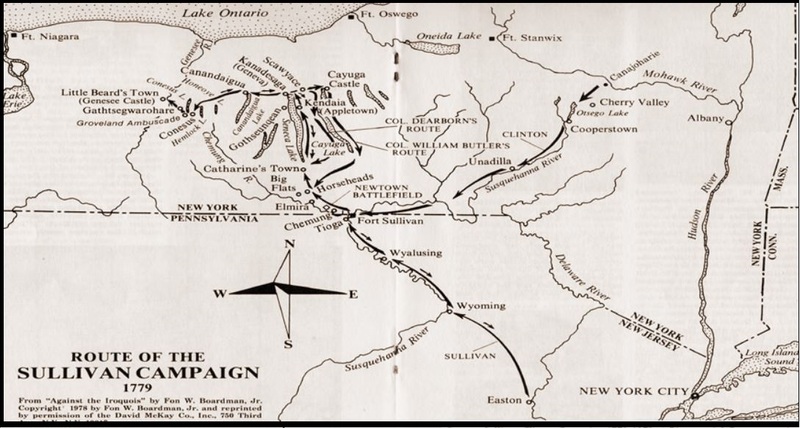 Since receiving the game, I’ve run through the introductory scenario plus multiple plays through both he the Southern and New York campaign scenarios. In a most recent game with some players both new and experienced with the COIN series at Metropolitan Wargamers in Brooklyn, NY, the Indians had the frontier ablaze and my French were far too late to the action except for dumping money into the rebellion. The British forces had much of the East Coast and South locked down without much trouble from my tardy French navy. Ultimately, the Colonials squeaked out a minor victory and had some very lucky battle results in upstate New York. 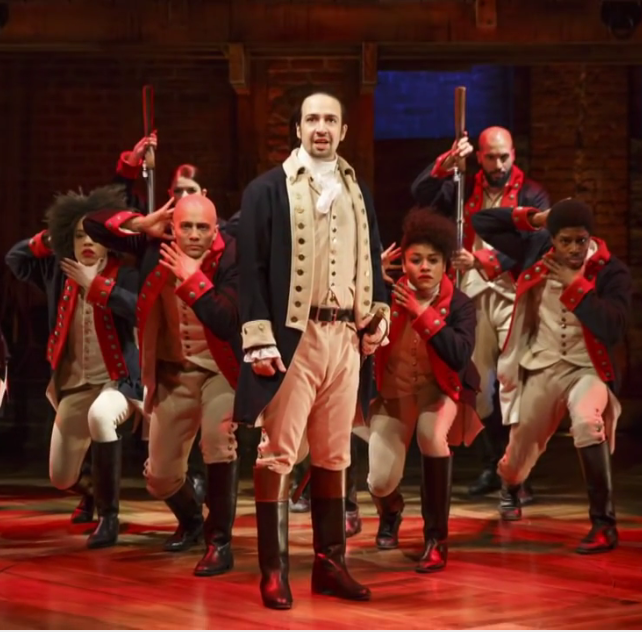 With my life split between growing up in Western New York and living in New York City for the past 20 years, the American Revolution was been a near-constant presence in my life for decades. 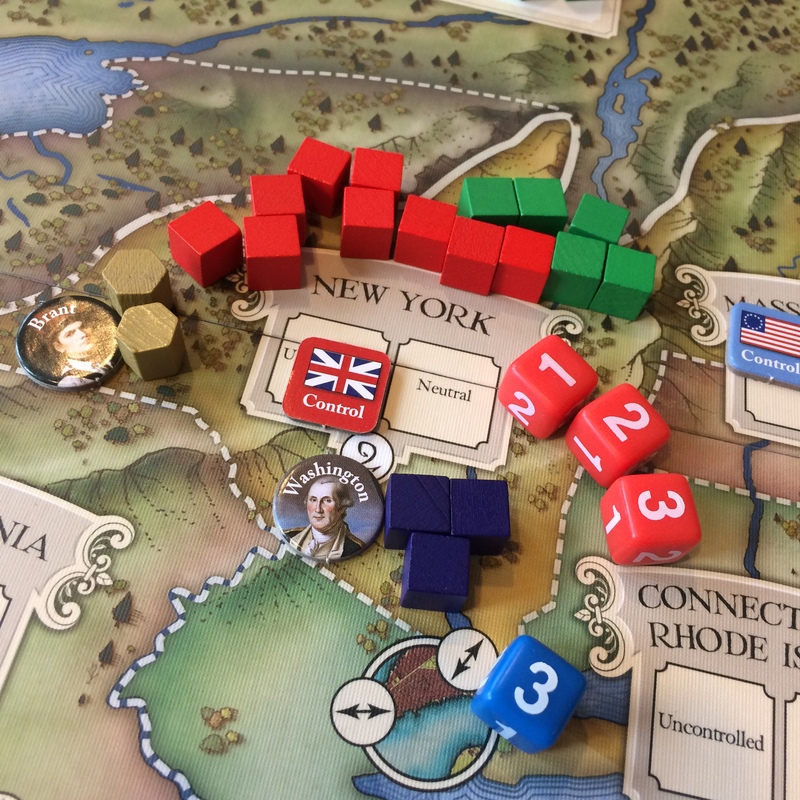 As a run-up to the release of LoD I threw myself into classic and contemporary games of the American Revolution, playing the period in a variety of mechanics and design. With a few games of Liberty of Death under my belt, I’m thrilled to have the period refreshed anew, and the game will be very much at home with my other American Revolution games. Last month, Quartz published a crowd-sourced online survey of how the rest of the world learns about the American Revolution in school. For most outside the US, the war is variably seen as a sideshow to other 18th-century European conflicts, an extension of the Enlightenment or ignored altogether. Children in the United States itself often leave school and march into adult citizenship with only the broadest mythic stories and American patriotic heroes of the war under their belts. 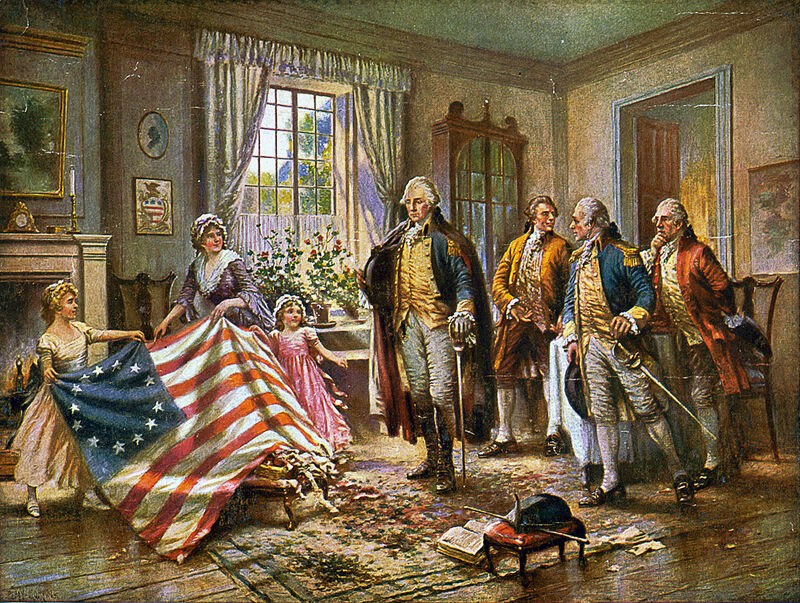 My interest in the American War of Independence has fluctuated over time since growing up as a kid amid the United States Bicentennial fervor of the mid-1970s. Having been in Brooklyn for almost two decades now, I’ve developed a growing interest in the war as I live and commute daily through the ground fought over during the Battle of Brooklyn and Battle of New York in 1776. Over the past year or two I’ve also been working through a minor obsession with boardgames of the American War of Independence. I’ve played many and collected a few ranging from classics of the early 1970s to modern games varied in scope and mechanics. Presented here is by no means a complete list of games themed on America’s defining early conflict, but an overview of the ones I’ve played or chosen to add to my inventory of wargames. Style, scope and time commitments vary with these games, offering interested gamers – both new and experienced – an opportunity to play and learn about the American Revolution anew with each tabletop session. 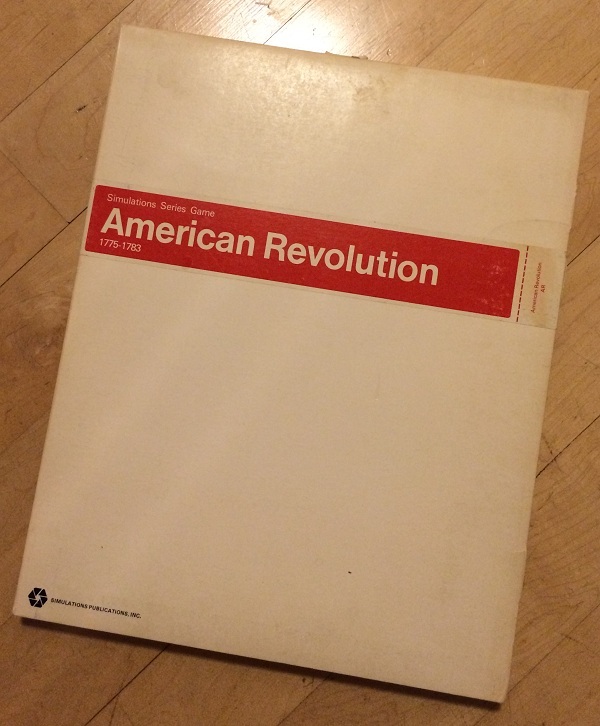 Simulation Publications Inc (SPI) rolled out The American Revolution 1775-1783 in 1972 a few years ahead of the Bicentennial celebration, and launched some revolutionary new aspects to wargaming along with it. Breaking from the tradition of a hex-based wargame map of the time, SPI’s game is laid out in a graphic abstract series of areas and regions with their own victory point values. Rules for the game are slim, and reference charts for turn sequence, movement, winter attrition, combat and reinforcements by turn season and year are all printed right on the map. The overall design, from the slick Helvetica font on the plain white box edition to the map itself has a great retro feel that sets it apart from other games of the early 70s. I’ve played In short, the game feels very ‘modern’ despite being more than forty years old. Cardboard chits with simple iconic graphics display force strength for the two main sides of the war, and movement is standardized in terrain marked simply as either as wilderness or open. Colonial forces move more effectively in wilderness areas than the British, making it easier for them to evade confrontation with the superior English troops. Staying away from the British until enough Colonial forces can be raised is key to any success for the Revolution. 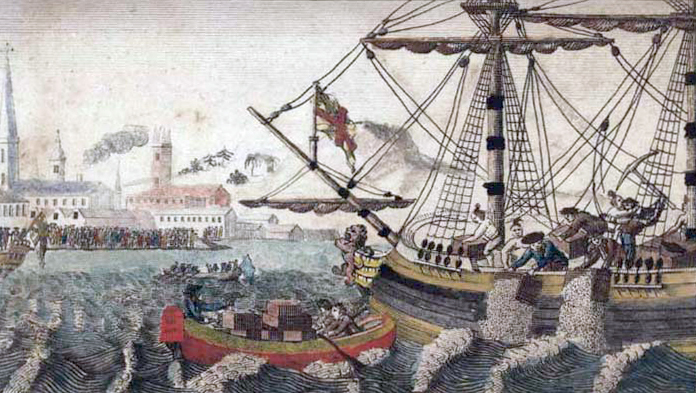 The arrival of additional British troops into ports is scheduled specifically according to the year and season of the game outlined at the edge of the board, and Colonial forces are raised and deployed through a random die roll levy. The mechanics whereby Colonial Militia and Tory forces deploy I find to be pretty accurately reflective of the regional politics of the era. Tories appear only once when British Regulars enter a region, and Colonial Militia take up arms against the British when they first enter a region they do not control and each time the British lose control. French forces arrive after a ‘major success’ (five or more losses by the British) in combat by the Colonials. All these well-thought deployment mechanisms stand out as big historical differentiators for me with this game. Combat is resolved through a die roll check on a simple table in a corner of the board which can result in very bloody losses to both sides as they meet in battle. First losses in battle always go to Tories of Militia forces which historically often left battlefields when the going got tough. Sieges are pretty simple with forces defending in forts getting triple their combat strength and attackers outside the fort doubling their value when counter-attacked by the fortified foes. Victory for the British comes by controlling a value of 51 victory points on the board, and the Colonials can win with three ‘major success’ battles. In all its abstract area movement and control, SPI’s game offers a slick game that captures just enough of the nuanced history of the period to more than satisfy. 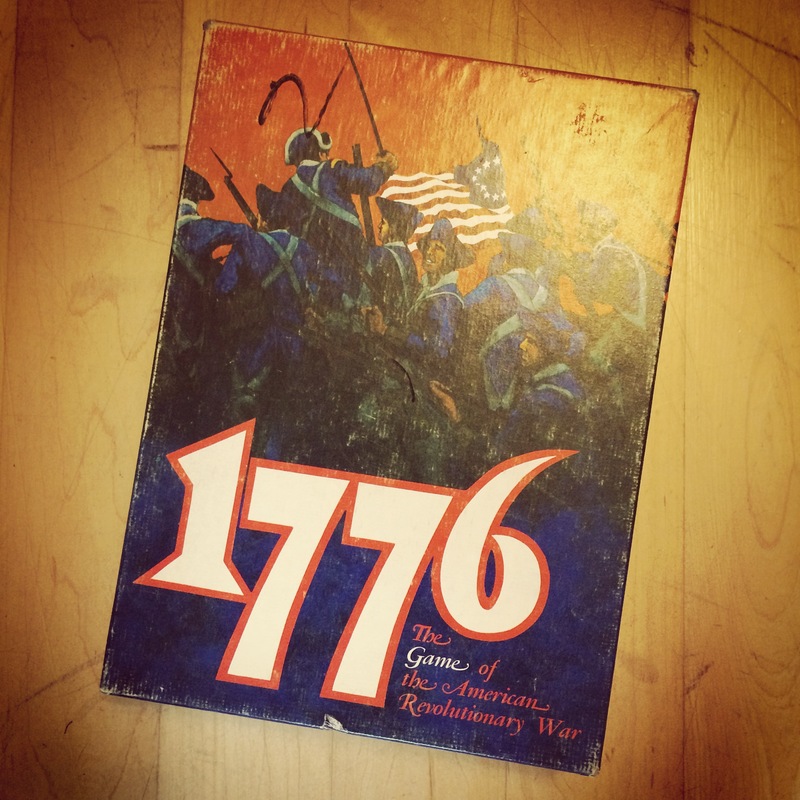 The other big game to come out before the Bicentennial was Avalon Hill’s 1776 from 1974. 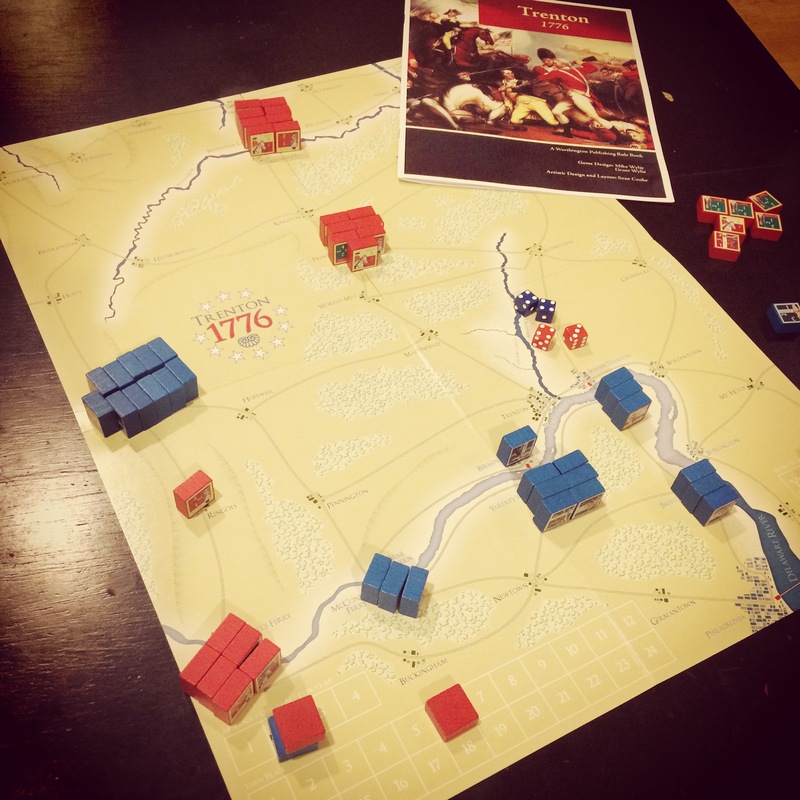 With rules running almost three times as long as those in SPI’s game, 1776 is often viewed as the more detailed play experience of the two. Some 400 counters represent infantry, artillery and dragoons for the Continental Army, British Regulars, Colonial and Tory Militia, French Regulars, Indians, and British and French naval units. The large mounted hex maps are filled with detailed terrain with each feature effecting movement and combat in different ways. Other tables for combat and turn sequence are contained on a series of additional reference charts, and tactical cards and scenario sheets round out the components in the hefty box. 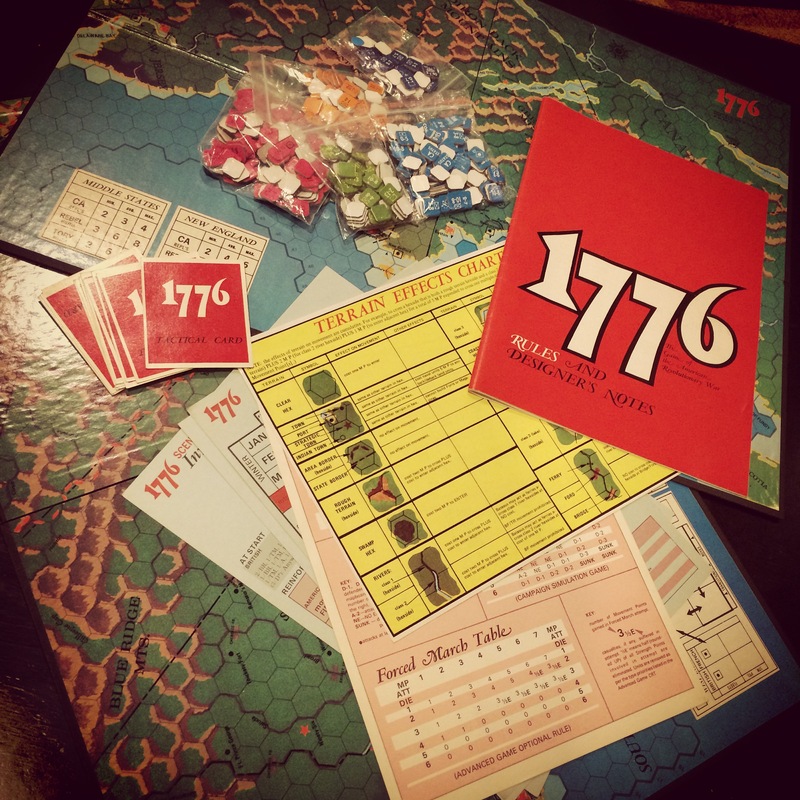 I’ve only recently picked up a copy of 1776 and I’m not certain when I’m going to be able to find an opponent to give this one a proper play. A read through the lengthy rules outline the game from a quick beginner’s experience to specific historic scenarios within the war to a full campaign mode covering the entire war. Advanced rules go deep in simulating the role of supply, forts, entrenchments, naval movement and combat, river movement by bateaux, wintering effects, French entrance to the war and the arrival of additional troops throughout the chosen game. Combat is achieved by a ratio of force size and a die roll modified by factors of supply, defense from forts and trenches and presence of artillery. Control of specific locations within a region is the key factor to the game, creating an interestingly complex dynamic for the raising additional forces as well as a path of victory. Aside from the game itself, the splendid designer notes offer a great general meditation on the trade-offs inherent to historic war simulation balanced with playability. For the gamer really wanting to roll their sleeves up with the intricacies of the American Revolution, 1776 is probably the game. Liberty: The American Revolution 1775-1783, published by Columbia Games in 2003, bridges the gap from traditional wargames to the present with relatively swift play, wooden blocks to represent British, Colonial, French and Native American forces, and simple cards driving force activation and supply during each game turn. The long game map consists of large hexes with forest, swamp and river terrain features which affect movement as well as geographic supply towns and key victory point locations. British and French West Indies ports allow for additional options in naval movement and combat. The game strikes a balance between simple rules and rich re-playability, and my time with the game has seen victories for either side depending on the session. In each year of the game, a hand of five dealt cards activate forces and re-supply existing forces which have taken step losses in previous turns. Actions may either move forces already on the map or bring new units onto the board by selecting from a random pool of blocks. A limited number of Native American blocks are allied with the British player only, and French forces may arrive randomly after the first turn beginning in 1776. Colonial forces arrive in controlled supply areas, British and French forces arrive by sea to available ports and Tory Militia rise from British-controlled supply areas. When opposing forces move into contact, combat is resolved by simple die rolls depending on the quality and strength of the blocks available. Blocks are reduced in strength and then eliminated as ‘prisoners’ which may be exchanged at the end of the turn and returned to each player’s pool of available forces. At the end of combat, forces may have the option to withdraw or stay in the fight. Weather plays a random role in the game, potentially limiting combat during a turn year, and troops may be also eliminated in a wintering phase at the end of turn. 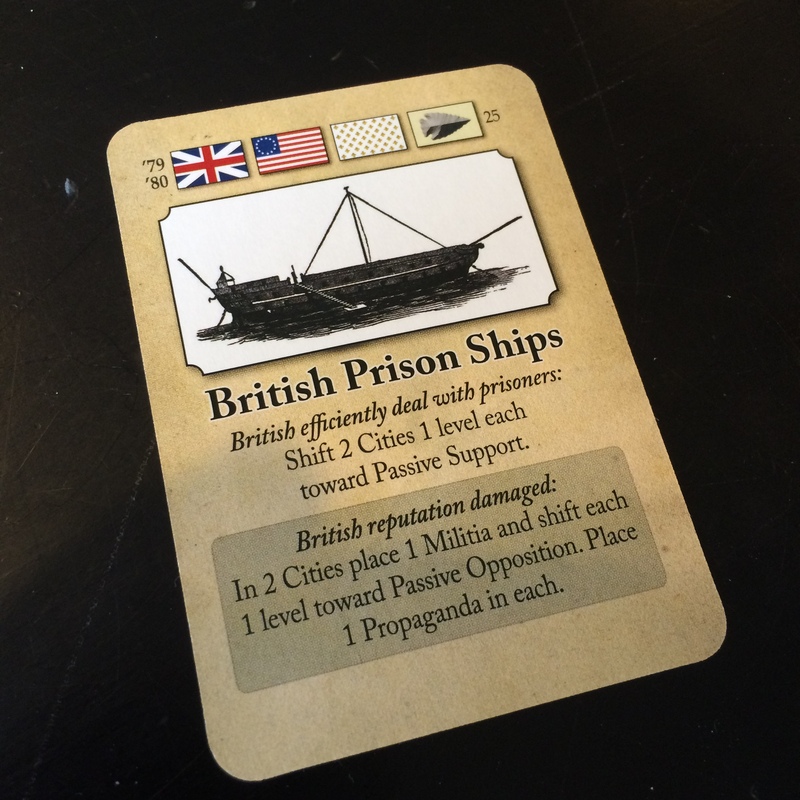 Victory is tallied at the end of each hand of cards and year with the British winning with 30 supply points and the Colonials by driving the British to under 12 supply points. 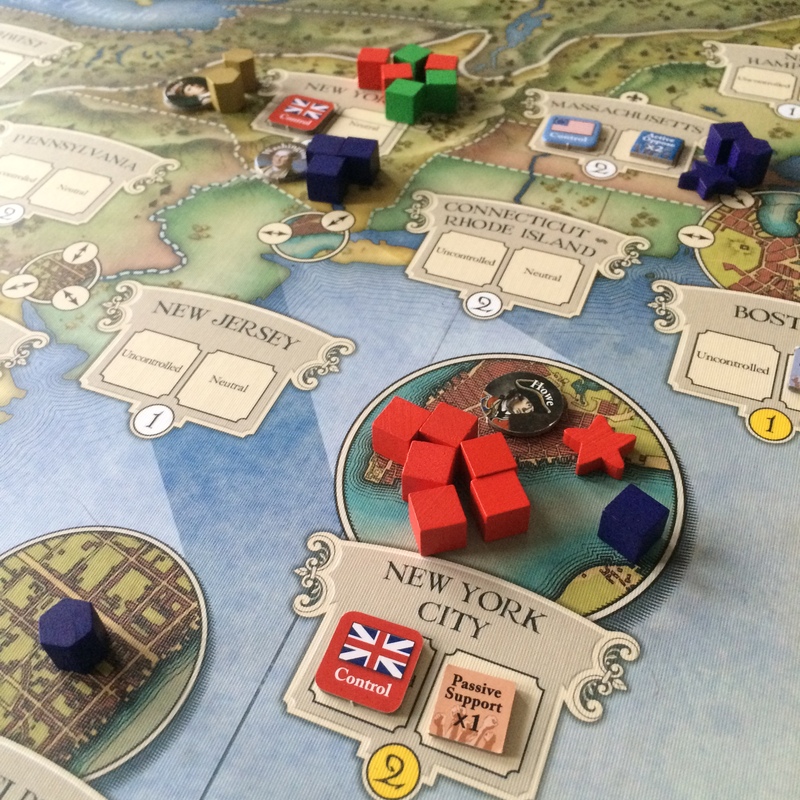 I’ve written previously in detail about 2013’s 1775: Rebellion from the Birth of America series from Academy Games, one of my favorite quick-playing boardgames of the American Revolution. 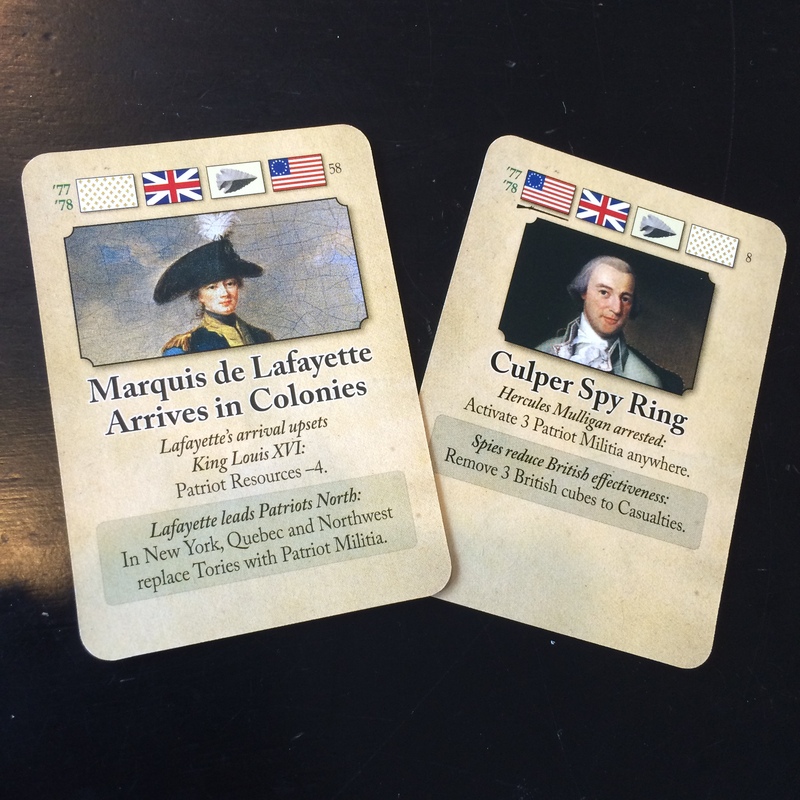 The game plays different from most in the period with two to four players able to command the American Continental Army, Patriot Militia, British Army and Loyalist forces in a game driven by card activation and randomized turn order. The four main forces plus French, Hessian and Native American allies are all represented by simple colored cubes moving and warring over a gorgeous game board representing the the colonies, territories and Canadian provinces of the northeastern American continent of the late 18th-century. Cards drive the action with movement, period-specific events and personalities, and special color-coded dice resolve combat as forces are either destroyed or flee to return in later turns. Areas flip to British or American control as combat is resolved. When two special Treaty of Paris cards are played, the game ends with victory rewarded to the player holding the most control of the board. If I’m going to play the American Revolution with a relatively inexperienced player or non-gamer, this is my go-to game for the period. 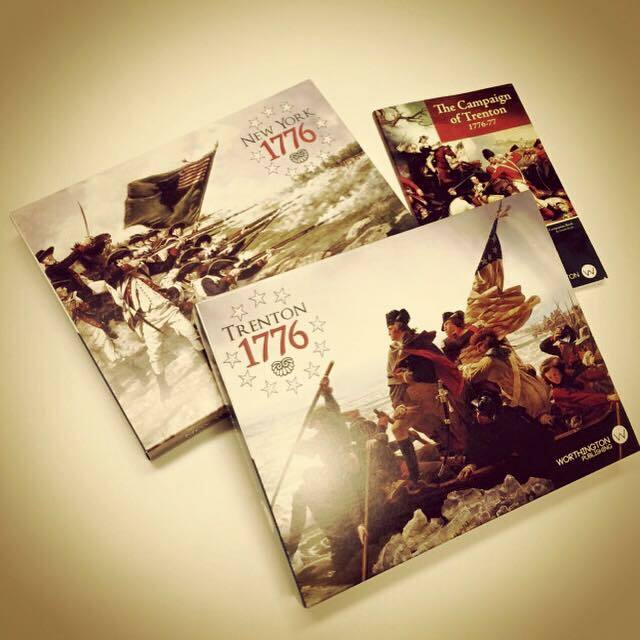 In 2014, Worthington Publishing launched their ambitious Campaigns of the American Revolution series with New York 1776 followed by Trenton 1776 in 2015. 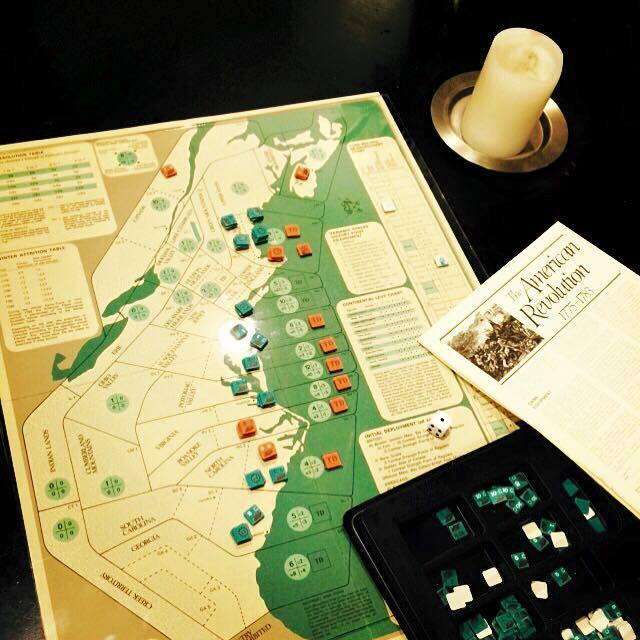 These strategic block games, funded through popular Kickstarter campaigns I backed, take players through specific stages of the war beginning with the action on Long Island and in and around New York City in the summer and fall of 1776 and continuing the conflict into New Jersey in the winter of 1776 and 1777. While the games do not directly connect to each other in a grand campaign, each two-hour game is well-scaled to the strategy inherent to each series of battles in the early years of the war. Randomized turn order, variable numbers of turn actions and the block components provide a fog of war mechanic to the game as forces move by themselves or as groups under the command of the many leaders present on each side. Movement is broadly point-to-point on game boards simply illustrated with towns, ports, forts or other key geographic points of control. Combat goes off as forces meet on the map with infantry, artillery, leaders and fortified positions playing into results that can include withdrawals, retreats, fleeing Militia and follow up attacks. Command plays several roles in these games, including being able to move groups of forces and other scenario-specific special rules in battle, deployment and victory conditions. 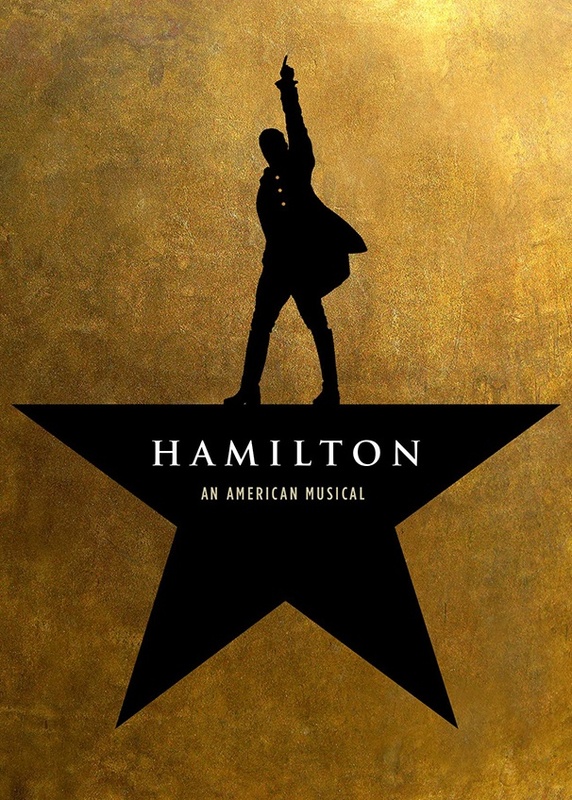 New York 1776 presents the largest meeting of troops during the American Revolution with the professional British army and navy, along with their hired Hessian allies, looking to halt the uprising of the new American Colonial army and Militia in the early months of the war. 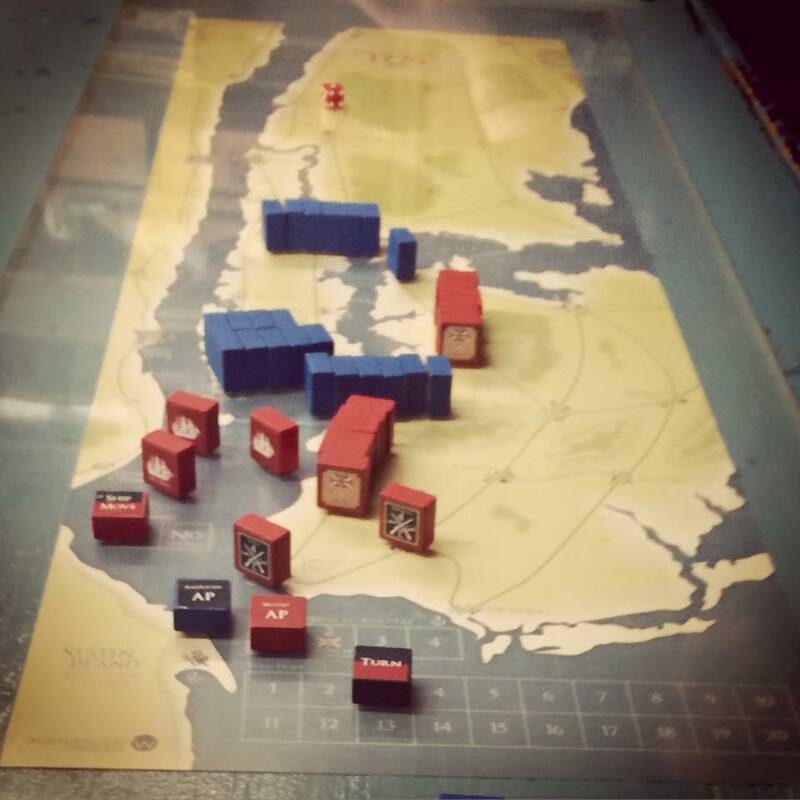 Controlling the waterways and supply routes around New York with the British navy plays a big part in the British player’s path to either capturing Washington or controlling New York by game’s end. 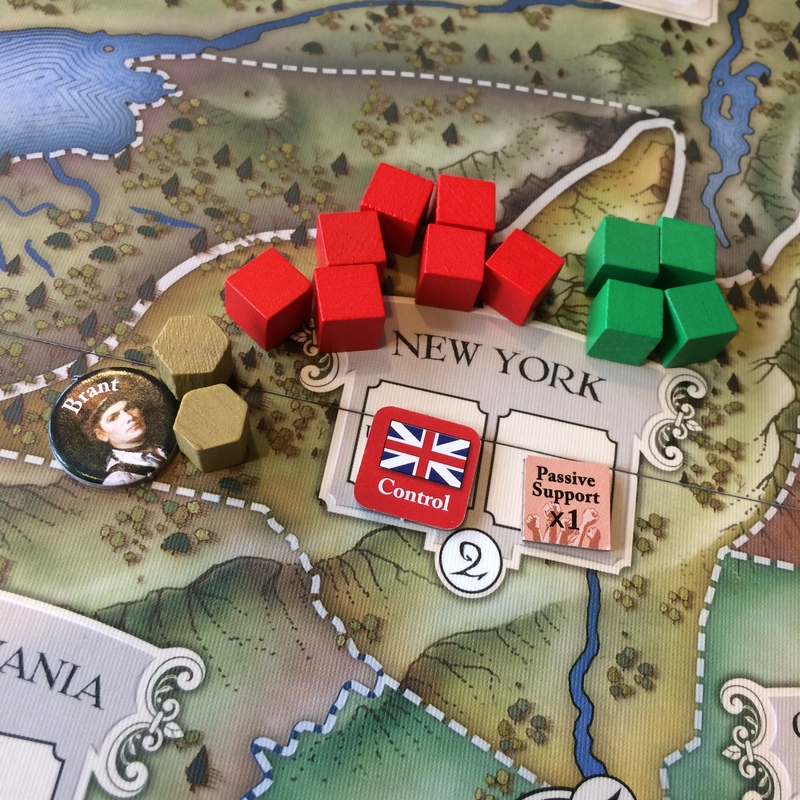 For the Colonial player, the game is largely one of avoiding the mass of better rated British troops, preventing their control of New York or reducing the superior British army by 20 points. In Trenton 1776, the action moves to smaller scale engagements in New Jersey as the British looked to smash the Colonial army and Militia retreating from their defeat in New York. With Washington in command, he risks bold counterattacks to push the British back out of southern New Jersey or simply moving to safety south of the Delaware. Howe’s pursuing British army must mass its forces against the rebel army at key towns and river crossings and hopefully push to seize Philadelphia as the icy winter settles in. 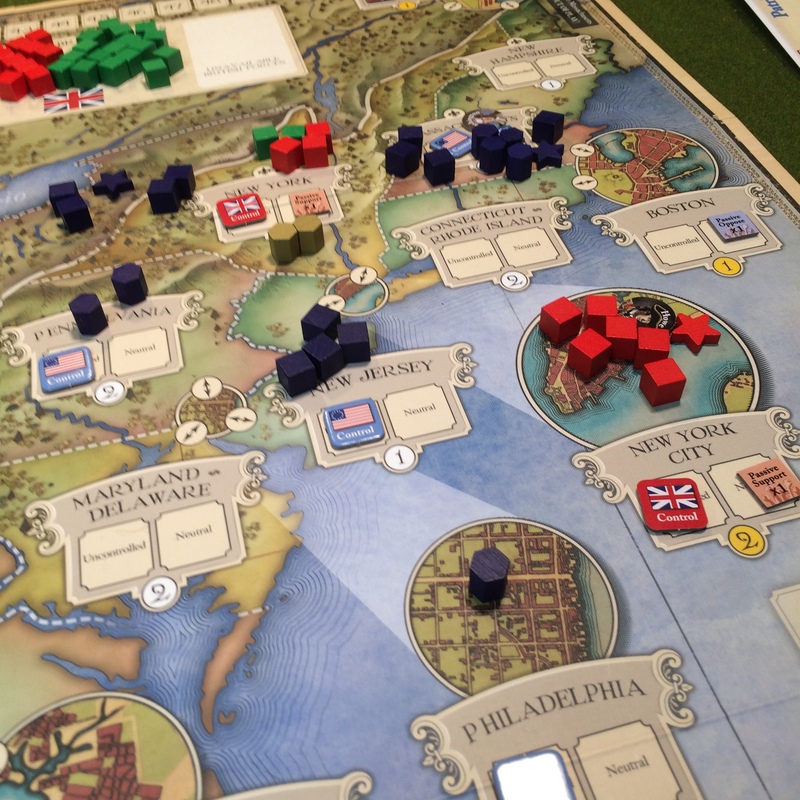 With similar rules but at a smaller scale than New York 1776, multiple plays of Trenton 1776 can really show players how cautious or aggressive decisions can make or break a campaign. I’m really looking forward to the release of Liberty Or Death: The American Resurrection, due out late this year. The sixth game in the counterinsurgency (COIN) series from GMT Games, I’ve had this one on pre-order based on my love for the other COIN games. 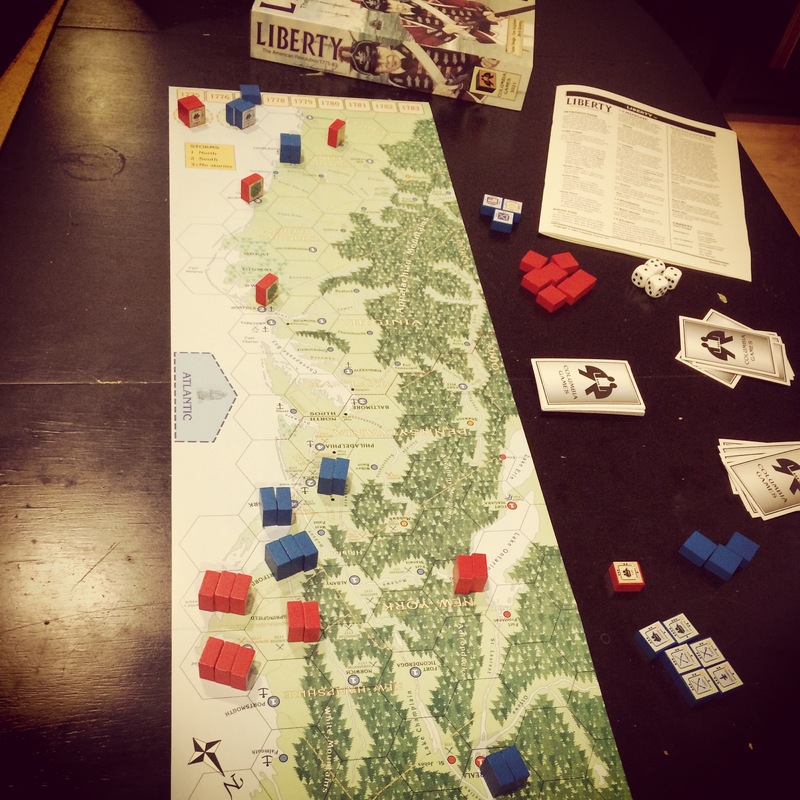 Playing from solo to four players, Liberty Or Death will present the war as one of insurgent and counterinsurgency forces of American Colonials, British, French and Native Americans warring for control of the North American continent. As in the other COIN games, shifting alliances, varied turn order, separate victory conditions, irregular forces and historically-themed event cards will each play into a game which will greatly expand beyond the typical presentation of the war as one between just two opposing nations. Early reports from game tests and some sneak looks at artwork make this my personally most anticipated game of the year, and I’ll surely be back with a full report in the coming months. 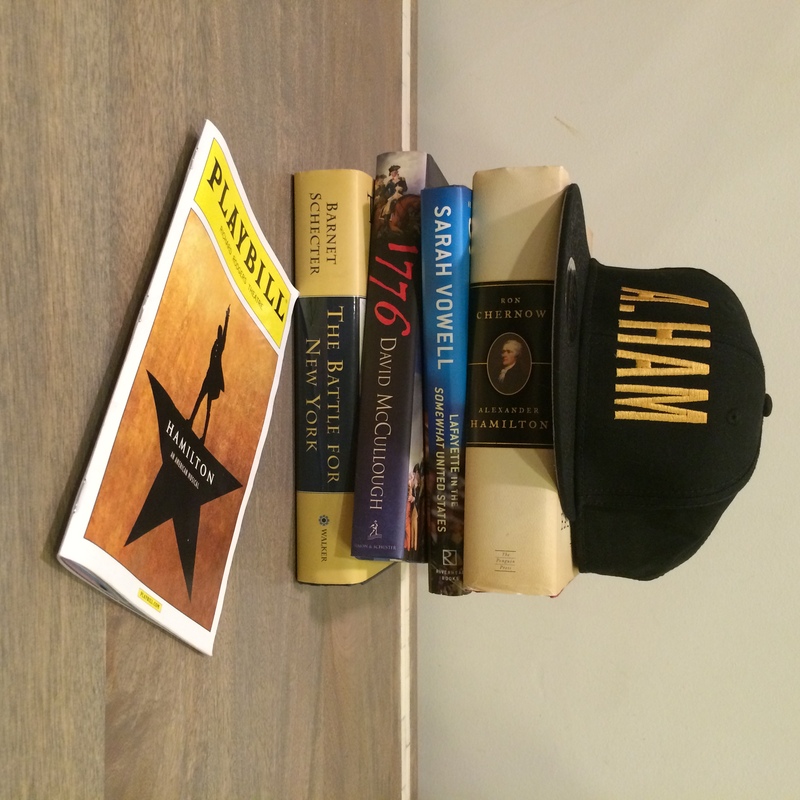 So where to start with the American Revolution? The 1970s era SPI and Avalon Hill games will appeal the most to experienced strategy players looking to really dig into hours of the broad complexity of some or all the war within a very traditional wargame. On the flipside, the Worthington Publishing games provide short but replayable intros to gaming the period for younger players or those just getting into block games. The Columbia Games take on the war splits the difference by offering up relatively simple mechanics of a card-activated block game representing the entire war over a couple hours of play. The Academy Games game expands play to four players and allied forces in an abstracted area control strategy game that likewise covers the entire war in mix of card and dice action. The forthcoming game from GMT Games will reinvent the conflict anew within the context of four separate interests vying for victory. Players wishing to play through advanced strategic simulation of 18th-century warfare will be rewarded by time invested in the Avalon Hill and SPI games. The Columbia Games and Worthington Publishing games will also provide a satisfying combat simulation albeit at a much simplified level. 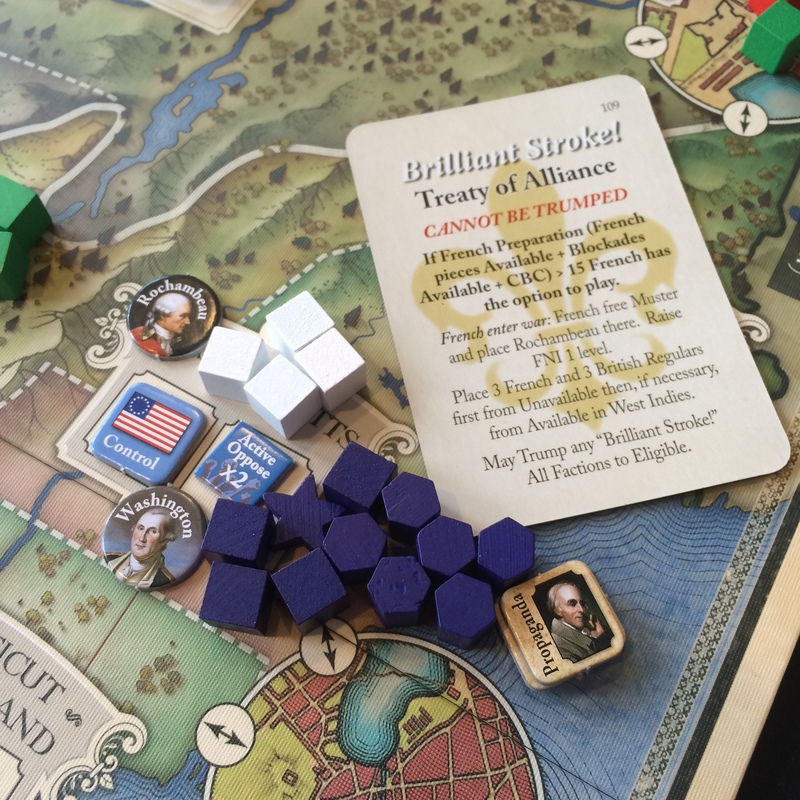 To experience more abstracted combat as well as the interplay of politics, alliances and events within the period of the war, the Academy Games and GMT Games games provide both relatively fast play as well as more of a learning experience about broader aspects of the American Revolution. 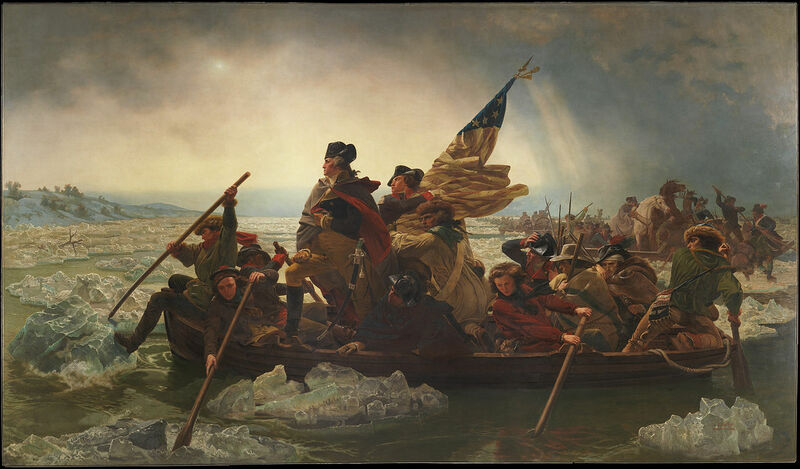 Each game above paints the American Revolution large or small, and together they are a fine reflection of the evolving mechanics of wargaming over the past forty years. There are numerous additional games of the American Revolution, some focusing on specific regional campaigns and many others presenting the full war. Games still on my shortlist to try include 2010’s Washington’s War from GMT Games and its 1994 predecessor We The People by Avalon Hill which helped launch the modern trend in card-driven wargaming. I sometimes forget that I was born during the Vietnam War, one of the more complicated military conflicts in American history. In April 2015 we’ll be sitting 40 years after the fall of Saigon and the pullout of American involvement in the region’s conflict which began in the mid-1950s. To mark the occasion, the US government has quietly launched a special 50th anniversary Vietnam War Commemoration website this past year. Decades later, the complicated legacy of Vietnam continues to reverberate as even the website has proven to be controversial. 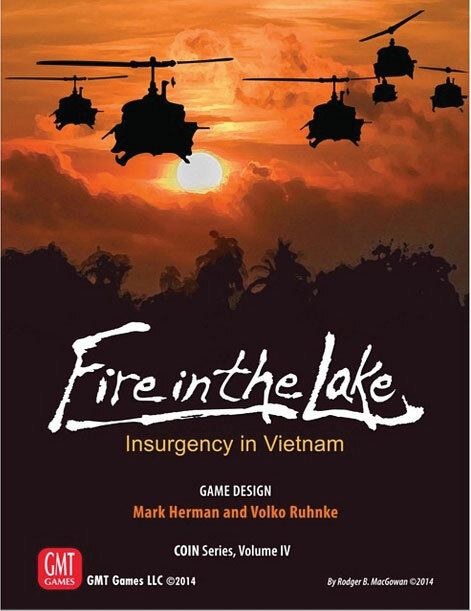 Having played a few games of Cuba Libre over the past year, I’ve finally had a chance to dive into another in the COIN Series from GMT Games this fall with the Vietnam War themed Fire In The Lake. The counterinsurgency (COIN) games focusing on modern conflicts have fast become new favorites among a lot of us at Metropolitan Wargamers in Brooklyn, NY, and since the summer a core group at the club have been working through multiple games of FITL and getting a decent handle of this richly complex game. Like other games in the series, FITL uses a card-activation mechanic to drive the game among the competing factions of US forces and US-allied South Vietnamese ARVN counterinsurgency and the insurgent northern NVA and Viet Cong guerrillas and regulars. Cards provide turn order at the top of each with a symbol for each faction. 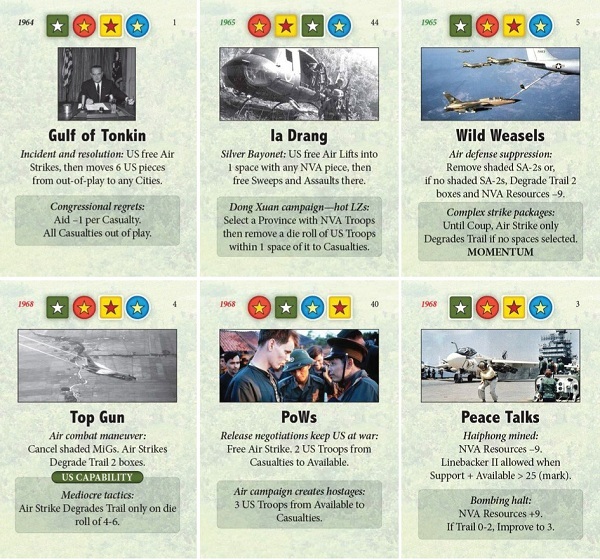 Each player chooses to use the Event on a drawn active card, conduct an Operation and/or possibly also conduct a Special Activity related to the Operation. Operations include such things as Rally or Train (recruiting troops, irregulars and/or building bases); March, Patrol or Sweep (to move and expose and/or remove guerillas), Assault or Attack (to remove enemies); and, Terror (to effect support and opposition). Adding in Special Activities such as the VC’s Tax and Subvert, the devastating Air Strike from the US, Ambush and Infiltrate from the NVA and the ARVN’s Govern and Raid makes for a powerful set of player actions. The card text contains effects beneficial to the US and ARVN COIN players at the top and NVA and VC events in a shaded box at the bottom. Events can produce either immediate benefit to the player using the card or a negative result to another player, so a player might choose to act on a card’s Event merely to prevent another player from using the Event. Keeping an eye on turn order and the next available card also drives decisions, as one player’s choice can limit or enable the next choice available to the following players. Every nine cards contains a random Coup card which pauses play for a round of faction-specific series of phases whereby resources are gained, troops are redeployed, pieces are reset and victory conditions are checked. Each of the four groups has their own path to winning the game with victory points scored at the edges of the board on a track that also marks Resources, Aid and Patronage levels. The VC score by shifting the population of provinces toward opposition and constructing bases while the somewhat allied NVA win through gaining population control and creating bases. The ARVN player gains points through population control and earning patronage from the population of the cities and provinces. The United States wins through shifting support and building up the number of available bases and troops (reflecting a victorious withdrawal of the military from Vietnam). The combination of random turn order, Events, Operations and Special Activities creates a dizzying amount of variation to how a FITL game plays out over a few hours. 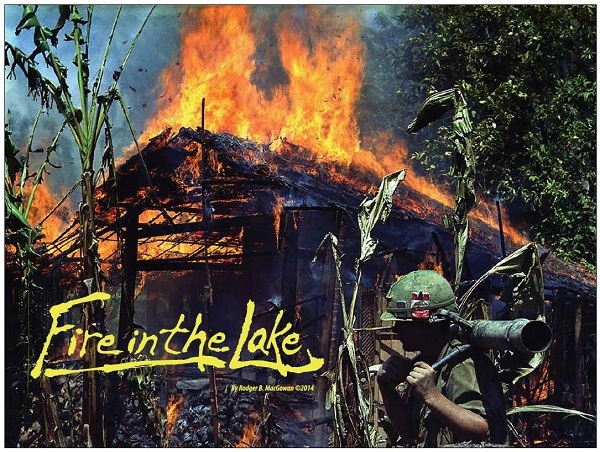 With many interdependent actions and victory conditions, an unpredictable stack of Event cards and uncertainly timed Coup scoring rounds, Fire In The Lake makes returning to Vietnam again and again a most worthy choice.